KAMPALA – Finance Minister Matia Kasaija on August 9 revealed that he is ready to withdraw the nomination of Ms Justine Bagyenda to serve as a board member of the Financial Intelligence Authority (FIA) should Parliament decline to vet her on moral grounds being that, she is still under investigations. Investigations on Ms.Bagyenda’s source of wealth was triggered off by a whistleblower after leaking her fat bank account details showing she had over Shs19 Billion in three different Banks and 17 properties in prime areas. Last month, there was an uproar both in the corridors and on the floor of parliament from members on learning that Finance Minister Kasaija had nominated Ms.Bagyenda awaiting approval by parliament to serve her second term on FIA board yet she was a subject of investigation over alleged money laundering by the same board she was being nominated to serve! MPs under the African Parliamentary Network against Corruption have upped their anti-voices arguing that she is not fit to serve on the board because of the controversies surrounding her right now. Apart from FIA, troubled Bagyenda is also being investigated by the Inspector General of Government (IGG) for similar allegations of accumulation of wealth which was not commensurate to her monthly earnings as a civil servant. The MPs queried why Kasaija nominated Bagyenda when she had been relieved of her duties at BoU by Governor Tumusiime Mutebile in February 2018 in a major shakeup at the financial regulator. It should be recalled that Bagyenda protested her sacking and insisted on remaining in office until she was due for retirement in June. She has however stripped off her instruments of power and her replacement Dr Tumubweine Twinemanzi immediately ‘installed’ in office. 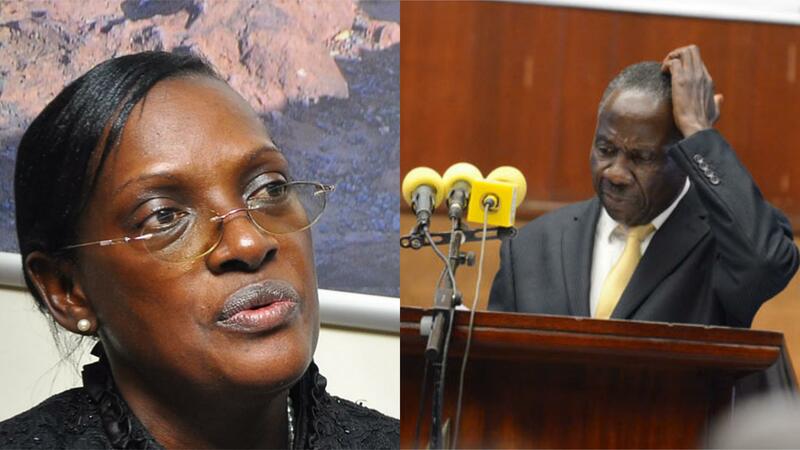 Kasaija in his defence said that he nominated Bagyenda on the board before she retired from BoU and allegations against her had not yet emerged. “The information we had at that particular time, this issue had not arisen,” he said. Kasaija said he would listen to the directive of Parliament on Bagyenda’s matter. “I proposed her name to Parliament. It’s up to Parliament now to tell me what to do, because if I took a decision it would mean I’m prejudging Ms Bagyenda. The names were sent to Parliament for vetting, if Parliament says no and they have got good reasons, I will abide because I can’t appoint until Parliament has given me the authority to do so,”Kasaija said.